Thermocharger is a revolutionary new air cleaner housing that is thermostatically controlled to maintain a hot air induction temperature during all weather conditions and produces more power than cold air induction. DO NOT use a hot cooling system and conventional ignition timing with the Thermocharger air cleaner housing. 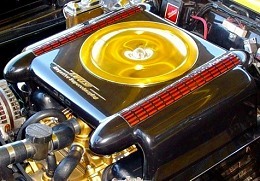 It will REDUCE power and cause pre-ignition (pinging) with hot air induction. We developed the Thermocharger air cleaner housing in 2002 to improve the performance of Negative Pressure Supercharging during cold weather. We found the larger volume of cold air pulled into the engine by Negative Pressure Supercharging during low rpm is more difficult to ignite the colder the air induction temperature. By increasing the air induction temperature, the hotter intake charge produces a faster burn and more combustion pressure which produces more power and faster acceleration. 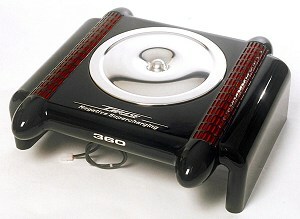 We introduced the Thermocharger air cleaner housing as a new product in 2005. Our History explains why we waited 3 years.